Royal Enfield Bullet and experiences: Royal Enfield-Choppers special ! Everybody likes to customise motorbikes to suit their own tastes and comforts. I have not done much on my Royal Enfield. 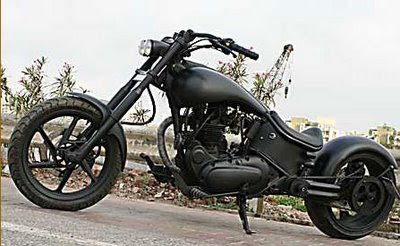 I came across some pics of Bullets modified into choppers.aka US ishtyle.Personally I am not much in favour of wild modifications unless safety factors have been considered and is legal so that you can ride free without looking out for cops ! Click below for more pics and details on customized Royal Enfield Choppers ! i would like to kno where u did this? Hi, Please click the link on the blog to let you know more on it ! There are lot of folks doing chopper bikes out here !